Thermocouple troubleshooting can cause big headaches for instrument technicians. PIE thermocouple calibrators source and read up to 14 different types of thermocouples with laboratory accuracy with 0.1° resolution in both °F and °C. The PIE models 525B and 525Plus have high resolution to 0.01°! 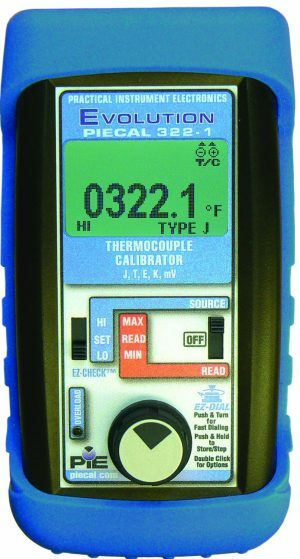 In addition to these standard calibrator functions some of our models have advanced features to help troubleshoot problems with thermocouple sensors, wiring and connections. 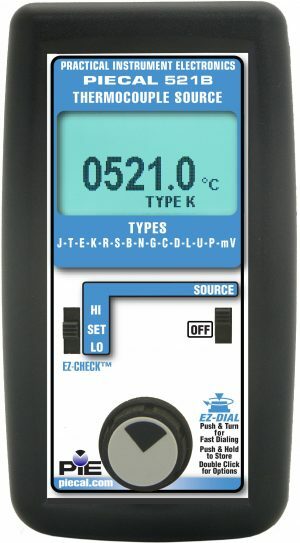 These can quickly help you locate and fix many frustrating problems with temperature measurement systems. 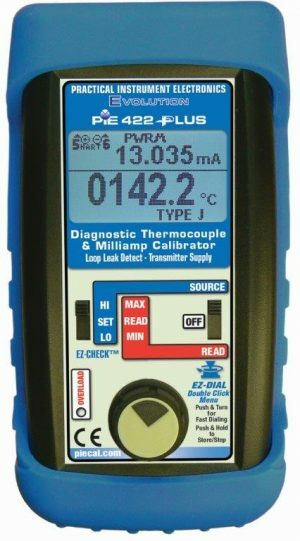 Save costs and improve uptime by replacing thermocouple probes as they are approaching the failure point. Replacing them too early increases your costs while waiting for them to fail can lead to expensive downtime charges. The PIE 525Plus is the only calibrator that measures the resistance of the cables and sensing element at the same time it displays the temperature in °C or °F while the probe is installed in the process. Probes with high resistance should be replaced before they burn out. 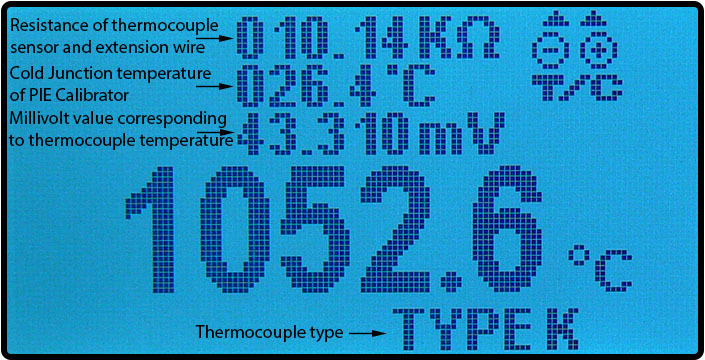 Open thermocouples and thermocouples that have high resistance indicating impending failure are indicated by OPEN TC and the resistance value on the display. Corrosion or loose screws can cause high resistance connections leading to a false burnout condition when the thermocouple sensor itself is functioning. 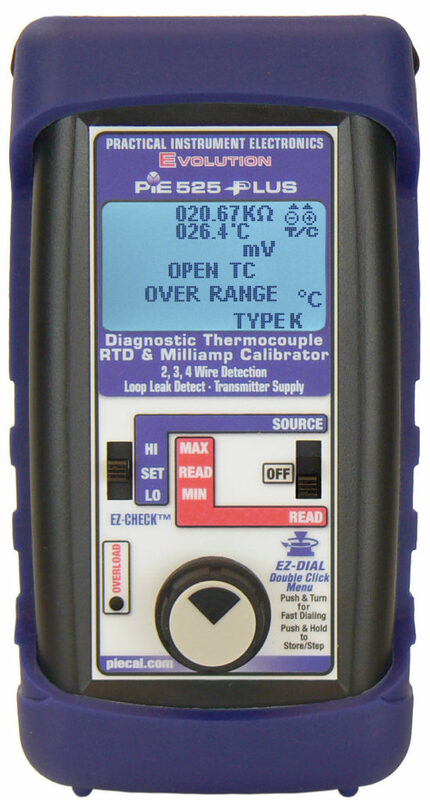 Use the PIE 525Plus to measure the resistance of the thermocouple probe at the point where the connection is made to the instrumentation. This indicates the resistance of the entire thermocouple run including the resistance of all the extension wire and any connection points. If you find high resistance, start working your way toward the sensor and check the resistance at each connection back to the sensor which will help you isolate the section of the extension wire or connector causing the high resistance. 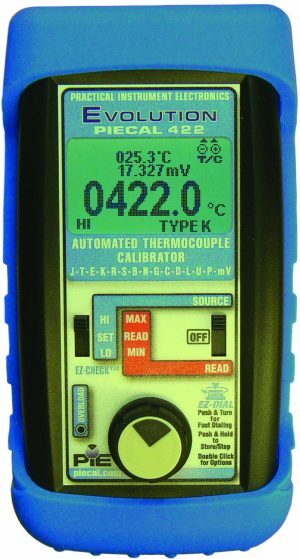 Some PIE calibrators include a secondary display which shows the millivolt value corresponding to the thermocouple temperature to verify that the temperature matches the millivolt value found in the thermocouple temperature vs. millivolt table. This is handy as a double check that the correct thermocouple type has been selected. Our advanced models also indicate the cold junction temperature at the point where the thermocouple wires meet the calibrator. PIE’s unique fuse-less circuitry also protects the calibrator against mis-connection. 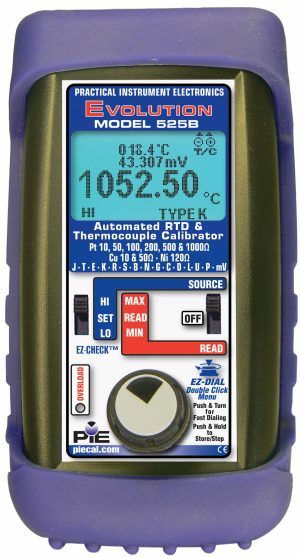 If you accidentally connect the wires across the 24 loop supply, or any connections up to 60 VDC, the calibrator will light up the OVERLOAD LED and will continue to function accurately when reconnected correctly. No more searching for non-standard fuses! A thermocouple generates millivolts when the two ends are at different temperatures. The thermocouple tables were developed by holding one end exactly at ice point (or more precisely called the triple point of water) at 0°C (32°F); then the other end was exposed to different temperatures and the millivolts were measured and recorded into the table. These two ends are referred to as the “Hot Junction” (the tip of the sensor) and the “Cold Junction” (where the wire plugs into the calibrator). In order to to reproduce the millivolt readings from the table you have to keep the “Cold Junction” at 0°C (32°F). In a lab technicians use a thermos filled with a slurry of distilled water and ice or a device called a triple point of water cell for the cold junction. It isn’t practical to carry a thermos of distilled ice water around when ever you want to make a temperature measurement. To make life easier, you can use a thermometer to precisely measure the room temperature, look up the corresponding millivolt value for the room temperature on the table then subtract that number of millivolts from the measured millivolt value from the unknown temperature being measured. This is referred to as “Cold Junction Compensation” and is built into all thermocouple measuring devices including controllers, transmitters, PLC input cards and PIE calibrators which do these steps automatically. 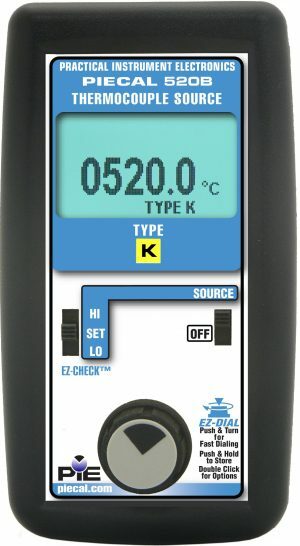 In typical use, our calibrator is plugged into a thermocouple measuring instrument such as a controller, the output temperature is dialed on the calibrator and compared to the temperature displayed on the measuring instrument. This works at any room temperature because both devices have built in cold junction compensation. Multimeters are designed to measure millivolts and do not have built-in cold junction compensation. There will be an error between the PIE calibrator and the multimeter equal to the number of millivolts on the thermocouple table at the current room temperature! Click here to learn how to use PIE’s handy calibrators with built-in tools to troubleshoot hidden problems in process control loops.